Jesus' empty tomb testifies to God's resurrecting power. Our fear of death will be eliminated by the hope found when we peer inside Jesus' tomb. Please read Matthew 28:1-17 before starting GraspingGod.com's free Bible study lessons, #3.16. Previous lesson: Did Jesus Go To Hell? #3.15. 1) Who buried Jesus in his own tomb? 2) Who were in attendance when Jesus was buried? 3) Did an angel have to open the tomb so Jesus could exit? 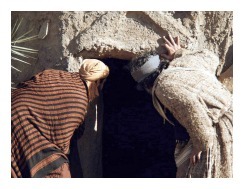 Christianity rises and falls on the subject of the empty tomb of Jesus Christ. The statement's implications involve Jesus' divinity, his atoning sacrifice, and his very real physical death. 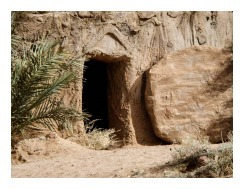 It's due time we discuss in detail our Lord's greatest victory - Jesus' empty tomb. A Roman crucifixion was meant to bring the uttermost in shame upon an individual. The punishments were all performed in full public view. The Romans shamed criminals in order to deter others from committing similar unlawful acts. The Jews knew this and wanted Jesus humiliated, so his disciples and others wouldn't be tempted to carry on Christ's work. They wanted Jesus shamed and his movement squashed. The Jews surely wanted Jesus buried in disgrace, as well. They wanted Jesus off the cross and buried immediately because of the approaching Passover Sabbath (John 19:31). They wanted this death behind them and Jesus' body removed so they wouldn't experience more distractions. However, Joseph of Arimathea approached Pilate to request that he bury Jesus' body in his own tomb. Joseph was a rich Jewish man and member of the Sanhedrin (Mark 15:43). He was opposed to crucifying Jesus and was in fact a secret disciple of Christ (John 19:38). 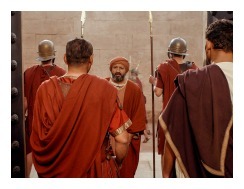 Pilate, upon hearing from the centurion that Jesus was dead, granted Joseph permission to bury Jesus. Awhile later on Friday evening, Joseph of Arimathea and Nicodemus took Jesus' body down from the cross and brought him to Joseph's tomb which was located nearby in a garden. This new, undefiled tomb, recently carved out of rock, now became Jesus' tomb. Joseph and Nicodemus prepared Jesus' body with burial spices and linen cloth, while Mary Magdalene and another woman named Mary watched. Jesus' humiliation was complete. The public shame was finished. His spirit was with his Father in paradise, and his body was buried with honor amongst the rich. There is a fascinating prophecy about what was just described. Seven hundred years earlier, God wrote through Isaiah, "He had done no wrong and had never deceived anyone. But he was buried like a criminal; he was put in a rich man's grave." (Isaiah 53:9). These accurate prophecies are amazing, faith-building truths found in God's word. Jesus was laid in the tomb, his body tattered, torn, bloodied and beaten beyond recognition. There was no pomp, no crowds, not even the customary Hebrew wailing. He was buried as a criminal, but remarkably with the rich. Jesus had no personal belongings that were placed with him - nothing special whatsoever. 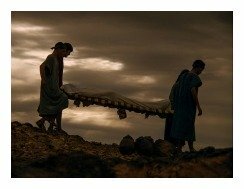 He was wrapped for burial and laid upon a stone bed. The two gentlemen quietly turned and left Jesus in the tomb to rest in peace. The tomb encased Immanuel's body and that was all. He was buried in the heart of the earth (Matthew 12:39-40). Joseph rolled a stone over the entrance to Jesus' tomb and the group of four quietly went on their way. The Jewish leaders badly feared Jesus' resurrection (Matthew 27:62-66). They beseeched Pilate for guards to be placed at Jesus' tomb and he irritably consented. The Jews posted guards at the site, but also sealed the stone that covered the opening of the tomb of Jesus. The seal was a cord covered with clay or wax and which was attached an official Roman seal. Jesus was dead and wrapped in burial cloth with a large stone sealing his tomb. There were Roman soldiers at Jesus' tomb. No one would dare attempt to remove a corpse against the forces of Rome, would they? Early on Sunday morning, Mary Magdalene, another Mary, and some other women left their homes to visit Jesus' tomb. They were carrying some spices for an additional anointing of Jesus' body (Mark 16:1). A strong earthquake struck the area. Remember, on Friday a serious earthquake shook Jerusalem when Jesus died. What could this new earthquake mean?! These women were already emotionally spent because of everything that happened over the past week, and now another nerve wracking moment takes place. What was God doing now?! An angel had descended upon the site of Jesus' tomb and caused the great earthquake! Something marvelous was about to occur. While the guards trembled in fear, practically falling dead, the angel rolled away the stone that was sealing Jesus' empty tomb. What?! The angel moved the stone so the women could witness the fact that Jesus rose from the grave. Jesus' tomb was empty! (Matthew 28:2-4). I hope you don't think Jesus needed the angel to move the stone for him. Oh no, Jesus was already up and out of the tomb when the angel arrived. The angel did the deed for the women, alleviating their fears about rolling away the stone (Mark 16:3). Jesus' empty tomb awaited the angel's appearance, so he could deliver God's message to the women. Jesus Christ can't be held by people, earth, death, Satan, or anything else. Jesus Christ's resurrection proved it! The intimidating angel instructed the women to go and tell the disciples. He said, "I know you're looking for Jesus, who was crucified, but he isn't here! He is risen from the dead, just as he said would happen." (Matthew 28:5-6). After looking in the grave, the women ran from Jesus' empty tomb with great joy. To their astonishment, Jesus met them on the way. They fell on the ground worshiping him. He told them to continue onto the disciples, telling them to meet him in Galilee (Matthew 28:10). They followed his instructions. Some people point out that Jesus was only in the tomb for two days and nights - not three. They say from Friday evening until Sunday morning is two days, and they're correct according to 21st century thought. But one must discover the customs of other cultures during different eras. The Jewish custom at the time was that any part of a day, no matter how small, was referred to as an entire day. So, Friday evening was a "day and night," all day Saturday constituted a "day and night," and Sunday was referred to as a "day and night." Simple and straightforward. Other verses refer to the time, as well, Mark 8:31 says, "And He began to teach them that the Son of Man must suffer many things and be rejected by the elders and the chief priests and the scribes, and be killed, and after three days rise again." Yet, 1 Corinthians 15:4 says, "And that He was buried, and that He was raised on the third day according to the Scriptures." Finally, Luke 24:5-7, "And as the women were terrified and bowed their faces to the ground, the men said to them, 'Why do you seek the living One among the dead? He is not here, but He has risen. Remember how He spoke to you while He was still in Galilee, saying that the Son of Man must be delivered into the hands of sinful men, and be crucified, and the third day rise again.'" We can see that the term "after three days" equates to "on the third day." Has Jesus' tomb been found? There is much talk, even major television documentaries, on the alleged tombs of Jesus. There are additional claims about the discovery of Jesus' family tomb. The lost tomb of Jesus, that is, the actual tomb in which Joseph of Arimathea buried Jesus, was also reportedly discovered. The problems with the reports begin with the fact that most within these groups believe the bones of Jesus will be located within the tomb. There are some serious erroneous assumptions factored by these teams of archaeologists. They don't understand that Jesus' empty tomb was abandoned by the physically resurrected Christ. Jesus' body, including his bones, are no longer in the tomb! Jesus is Risen! Watch the shows, read the articles, but, believe your Scriptures because they are inspired by God himself. My friends at CARM can assist a person in thinking reasonably through these current events. The creation cannot contain the Creator. Jesus' created beings first sinned against him, making his appearance as a human mandatory. He was the only One who could satisfy the Father's demand for recompense for human sin. Satan and humans then tortured him, but that wasn't enough to keep him down. 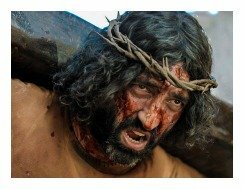 His punishment by God was unbelievably difficult to endure. Humanity murdered him, hanging him out to public shame. He was buried as a criminal in the heart of the earth, behind a stone, guarded by soldiers. Neither could those earthly barriers contain the life of Jesus Christ. His spirit lived and his body rose from the grave. Jesus' empty tomb is the symbol of the resurrecting power of God almighty. Has Christ called you to his cross? Has the power of God rolled away the earthly stone that has blocked your heart? 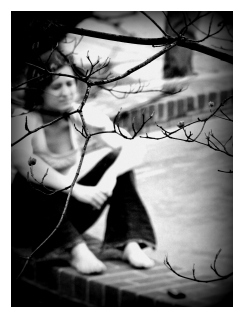 Has the Spirit of God raised your soul from it's love of sin? Has God opened your mind to understanding the wisdom of the Bible? The power of God makes true believers. He makes disciples of Jesus Christ who live for God. Peek inside Jesus' empty tomb, believe, and let the risen Lord renew your life. Next lesson: Jesus Is Risen! #3.17. 1) Why didn't the disciples of Christ protect Jesus' empty tomb, possibly enshrining the site? 2) Jesus raised the dead and he himself was raised by the Spirit. Do you feel this is important enough to share with non-believers during witnessing opportunities? Why or why not? 3) Suppose a report hits newswires saying that Jesus' bones were discovered in a Jerusalem tomb. Where would you turn for guidance in discerning the truth? and you will fill me with the joy of your presence. Dear Heavenly Father, Eternal thanks to you for the power of your love. You possess the power to create and the power to recreate. You possess the power to make your Son into a human and to raise him from the dead. No stone mountain was going to contain our Savior! We praise your holy and righteous name, Lord. Reveal yourself to more people, so they're able to glorify you with their lives. Bring us peace, O God. Show us how to love you first, and our neighbor as much as ourselves. In our risen Christ's name, Amen. Share on Facebook below and download your free printable Bible study lessons, Jesus' Empty Tomb #3.16. Please Donate To GG.com! Special Note: I'm grateful to Big Book Media & Free Bible Images, Stock Exchange, Morgue Files, and Stock Photos For Free for the use of their photos for Jesus' Empty Tomb Bible study lesson.